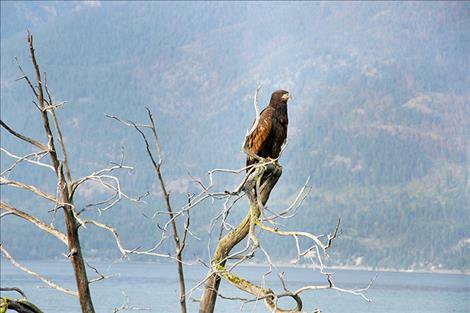 A juvenile bald eagle perches on the branch of a partially submerged tree giving it 360 degree views of the clear Flathead Lake water surrounding it. KALISPELL — Flathead Audubon is continuing a tradition started by the family of the late Rod Ash in 2006 by sponsoring the 12th Annual Birds of Prey Festival at Lone Pine State Park on Saturday, Sept. 15. This year’s festival begins at 9 a.m. and ends at 1 p.m. and features many exhibits, booths and programs. The U.S. Forest Service, Glacier National Park, Montana Fish Wildlife, and Parks, Hockaday Museum, Flathead Land Trust, and many other organizations will be there with fun activities. Fancy Face Design face painting will turn you and your kids into “raptors” for the day. Montana Coffee Traders will have their delicious bird-friendly coffee and lunch will be available for purchase as well. This year’s program lineup promises to be very “educating”. At 10 a.m. Professor Avian Guano will provide a family-friendly humorous look at his favorite oddball bird stories (for ages 7 and older). At 11 a.m. Denver Holt, director of the Owl Research Institute, and recipient of the national 2018 Chandler Robbins Award by the American Birding Association, will talk about Montana owls, including his “Hoots and Toots” stories. At noon, Beth Watne, director of the Wild Wings Recovery Center, will show and tell about plumage differences and similar species with live birds of prey, including ferruginous, red tail, Harlan’s, and Cooper’s hawks, great gray and pygmy owls, and peregrine, merlin and kestrel falcons. The 1-3 p.m. session will offer a two-hour training for new Citizen Science Hawk Watch volunteers. If you want to help us watch and count birds of prey from the Mt. Aeneas ridge-top in the Jewel Basin this fall (it is spectacular), join us for a new video and internet training session. Call 406-862-7960 or 406-837-0181 for more information. The program is free and open to the public. In conjunction with the Birds of Prey Festival, Flathead Audubon is offering a field trip to the Hawk Watch site on Sunday, Sept. 16, from 8 a.m.-5 p.m. This is a follow-up field trip opportunity for those planning to attend the Jewel Basin Hawk Watch training at Lone Pine State Park on Sept. 15 as well as anyone who is interested in seeing migrating fall raptors. The hike to the Hawk Watch site will take approximately two hours and is uphill at a moderately strenuous pace. Weather can affect the field trip so dress accordingly. The temperature and winds can make the “feels like” temperature 20-30 degrees colder at the ridge than in the valley. This trip is limited to nine people. If you’re interested in participating please call Cory Davis at 406-257-3166, or email him at: piranga99@gmail.com.